Text-to-Speech in a stylish keyboard design. The Allora 2 is elegantly designed for face-to-face communication! The detachable display/speaker can be worn around the neck on a lanyard, or given to someone to read the message, placed in the middle of the table for a meeting or at the restaurant, or you can attach it to the back of the car headrest for the back seat passenger to read. The speech output uses a high quality intelligible Realspeak speech synthesizer, and dual forward facing stereo speakers for maximum volume. All expected speed enhancement features are standard. Standard SMS module provides text messaging capability too! (Phone service is not included.) And the optional GEWA IR transmitter lets you operate appliances through the infrared environment control. 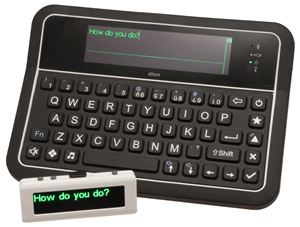 The Allora 2 is a well-designed, functional communication device, requiring minimal set-up and maintenance. 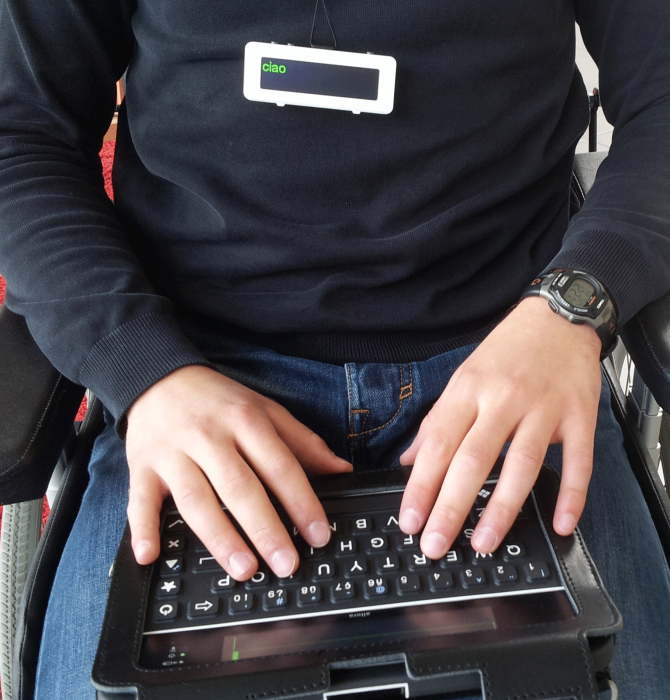 The access options of keyboard and switch operation make it suitable for people who have changing fine-motor needs. Allora 2 is a well-designed, functional communication device, requiring minimal set-up and maintenance. The access options of keyboard and switch operation make it suitable for people who have changing fine-motor needs. Allora 2 with detachable display Whether at school, university or work the NOTE section may be useful for writing and saving a story, speech, long note or other text. The note can be prepared on a computer and transferred to the Allora 2 to be read aloud; or prepared on the Allora, and printed from the computer, via the USB port (memory stick). For those who do not feel they need the advanced features of the Allora 2’s forward facing and detachable display, the original Allora 1 is still available. 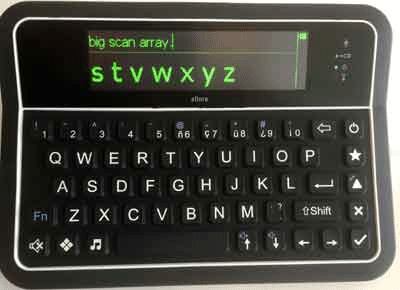 The Allora 2 TM comes complete with detachable forward-facing display, SMS text messaging module (ready for you to add a cell phone SIM card and phone service), keyguard, carry case, and power adapter. The Allora 2 RT comes with all that plus a GEWA infrared transmitter for environment control of TV, cable box, DVD, and more. GEWA ECU module to operate TV, cable box, DVD player etc.